This is a static and streaming provider for Wealth-Lab Developer that downloads free intraday and daily historical price data provided by Russian brokerage "Finam" (in Russian; English site). It covers all Russian exchanges and a wide range of world indices, ETFs, futures and currency pairs (F/X). This is required for the provider to function. 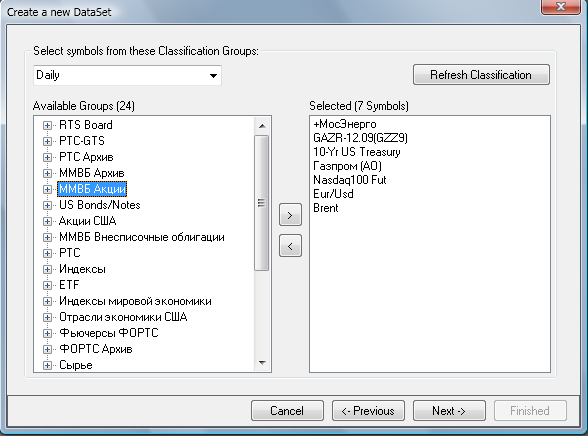 Currently, Finam offers historical data broken in 24 groups ranging from Russian markets to world indices. 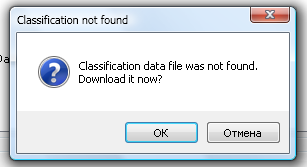 Classification will be downloaded from Finam's site and stored in your AppData folder. Note: it's not possible to select an entire group in one click. At any time, you can refresh the classification groups by loading the "Create dataset" dialog box and clicking "Refresh". This step is helpful when the data vendor adds new symbols or removes dead entries. Starting from version 2011.01 (requires Wealth-Lab 6.1), the provider now supports free Streaming intraday and daily data. To enable, open the Wealth-Lab's Preferences dialog > "Streaming Data" and tick "Finam Streaming Provider". To conserve bandwidth and reduce server load, partial bars are updated once every 10 seconds for snapshot quotes. Important! Across the Finam's market groups, there are symbols with identical names e.g. GAZP traded on RTS and GAZP as a FORTS futures contract. By design, it's not possible to keep multiple symbols with identical names. When updating, their data may get mixed up and broken. Do not include more than one non-unique symbol across your DataSets! There is no workaround for this. Since this provider is catered to Russian-speaking customers, having Russian locale enabled in your operating system is an absolute must to view the stock symbol names in a correct fashion. The provider can be installed and used in Wealth-Lab Developer only. Historical data downloads are currently single-threaded, because Finam's server throws sand in the wheels of concurrent download requests. Until a robust solution is found, tried and true single-threaded downloads are here to stay. When manually editing a DataSet, make sure you wrap symbols with a space in double quotes! e.g. "Company Ltd", NOT Company Ltd. Otherwise you'll get an exception. Symbols having '*' in their names (and possibly other characters that would have resulted in creation of an invalid file name) are not handled by the provider. The data is being downloaded but then it aborts the creation of the file. Since the issue affects only a handful of symbols outside the primary focus of the provider, we do not plan to fix it. Running multiple Strategies using Finam data in the Strategy Monitor is not recommended since doing this may result in incorrect data.